It is seven weeks since the full horror of terrorism was unleashed in this city killing 32 innocent people at the nearby metro station of Maelbeek (Mal­bek) and Zaventem airport. Today, I stand in solidarity with those who suffered great loss and with the first response units of this city whose bravery and professionalism undoubtedly saved many more lives on that terrible day. We stand together in our determination to tackle terrorism. I join you on May 9 – Europe Day – a poignant reminder to us all of the vision the EU’s founding fathers had 66 years ago to bring about peace and stability on the continent. What a powerful vision those individuals had to say ­ after two world wars – Europe will rise again as one, arm in arm in the name of peace and prosperity. The Schuman Declaration of 9th May 1950 stands as one of the greatest political achievements of the 20th Century. In that landmark speech 66 years ago, Robert Schuman wisely observed, “Europe will not be made all at once, or according to a single plan. It will be built through concrete achievements which first create a de facto solidarity”. And what progress we have seen ­ the development of a community of 28 nations and a single market of 500 million people. In contrast to these landmark achievements the standard of debate around the UK’s EU membership, to date, has been at best puerile and at worst just outlandish scaremongering. Of course, I’m no stranger to referendums. In my political life I have been an active participant in four and in 2014 led the YES side in the Scottish independence referendum of 2014. Now that vote was lost, but you could well argue that both the campaign and therefore the political aftermath was won. When the Scottish independence referendum campaign began in the first half of 2013, Yes were polling 28% of the vote, but on Election Day we recorded 45% in support for independence. The ‘No’ campaign had haemorrhaged 17 per cent of their vote in as many months. There is one very clear, obvious reason for that. The Project Fear propaganda drummed out of Downing Street and old Unionist grandees did not inspire people. It did not engage people. Its purpose was to beat down a nation but instead Scotland began to engage with a campaign that focused on the positives and gave people hope for the future. With support for the EU across the UK hanging in the balance, the Prime Minister should reboot the Remain campaign away from Project Fear mark two. There is an overwhelming need in the UK to reset the debate and focus on a positive campaign to highlight the great achievements of the European ideal. Of course Scotland has remained largely free of Europhobia – except for a token UKIP MEP who found himself elected by chance of a low European election turnout rather than any substantial electoral support. The two per cent his party achieved in last week’s Scottish elections is a more accurate assessment of their following. And I arrive here fresh from Scotland where the SNP has been returned to government with 47 per cent of the vote ­ a popular mandate which would be the envy of any democratic party across the Continent. That mandate is pro-­European and will seek to lead the Scottish ‘Remain’ campaign free from scaremongering. Instead, we will develop a narrative which demonstrates to a favourable but understandably sceptical electorate not just what the EU has achieved, but also what it could achieve. So let us set out now with clarity, the positive case for Europe and a new hope. The EU has given us all the freedom to live and work anywhere in Europe. That is a positive not a negative. Today, 173,000 EU nationals have chosen to make Scotland their home. Inward migration is vital to Scotland’s future economic growth and contributes enormously to our culture and economy just as the outward migration of Scots contributed hugely to the culture and economy of countries across the globe. And guess what? Just as the million of McDonalds are loyal citizens of the United States these hundreds of thousands of Europeans are loyal citizens of Scotland. Those who wish to drag us out of the EU say trade will remain but migration will end. This is a categorical misunderstanding of how the EU works as if we were to join the EEA or EFTA, as a proposed trade arrangements implies, then we would still have freedom of movement in return for access to the single market such as the case in Norway and Switzerland. If we didn’t then we would be in the territory of a long wait for trade agreements and substantial economic dislocation. That is the fundamental contradiction at the heart of the OUT campaign. The EU is the world’s largest single market, comprising upwards of 500 million consumers. Membership of the EU, and access to the single market, provides Scottish firms with access to more firms to trade with, and more potential customers to sell. Every sector of the Scottish economy benefits from the EU in one way or another. Annual exports to the EU are worth more than £2,000 per person and support 300,000 jobs. In 2015, there were over 2,310 foreign­ owned companies in Scotland, employing around 314,000 people with a combined turnover of £90 billion – around 42% of these companies were ultimately owned by firms based in the EU. And our economy doesn’t only look outward, Scotland benefits from inward investment from the EU more than any other part of the UK with EU companies adding nearly £16 billion to Scotland’s economy. Proving that our economy thrives on the mutual benefit of a working partnership and an entrepreneurial spirit that stretches across the continent. The EU has also been at the forefront of developing the digital economy. For the UK this has resulted in 43% of digital exports going directly to the EU. For the European Commission, completing the Digital Single market in services will open new doors to SMEs across Europe and provide an equal opportunity to sell digital goods and services, and giving customers the ability to buy and then use digital content across national borders. Scotland’s participation in Horizon 2020 enhances our scientific and business reputation, our ability to attract and retain world­class researchers, and our opportunities to access new markets and funding. Success is illustrated by the level of participation in programmes, with Scotland attracting more than its population share of funding. Scottish organisations have secured over 158 million euro (around £120million) or 11% of the total funding awarded to UK organisations. As well as investing, the EU is ensuring we don’t get ripped off. From mobile roaming charges to consumer rights – the EU has introduced a two year guarantee on all products and the introduction of a ceiling for roaming charges across Member States – with a complete end to roaming charges coming next year. The EU enables collaboration on the greatest challenges that face us today. At the beginning of this year, my home part of Scotland, Aberdeenshire, suffered an historic rainfall. Dozens of homes were evacuated after the River Don and Ythan burst their banks flooding homes, agricultural holdings and severely disrupting travel by road, train and plane. Many more communities were also affected the length and breadth of Scotland and indeed across the UK. With unpredictable weather fronts and increasing droughts, Europe has shown great leadership in tackling climate change. EU membership has offered Scotland the best framework to contribute to solving our collective problems such as climate change and the development of a low carbon economy. EU funding of £8 million has helped deliver the £19 million Aberdeen Hydrogen Bus project. The project demonstrates the production and storage of hydrogen for use in Europe’s largest fleet of hydrogen fuelled buses. Funding of many times that was on offer to allow the development of a hugely important wind demonstrator project in Europe’s energy capital. Or at least that would have happened if a certain American Presidential candidate hadn’t got in the way. Around £29million has been awarded from the European Commission’s programme for innovative low­carbon energy demonstration projects to both the Stroma Tidal Turbine Array and Sound of Islay. The projects will enter operation by December 2018. Scotland with European support is now the country closest to commercially unlocking the extraordinary green energy potential of tidal flow power. When it comes to renewables, we need the EU on our side. The London government has plunged down a deeply worrying blind alley with disastrous policies in scrapping the feed-in tariff for renewables, then subsidising by countless billions the doomed nuclear project at Hinkley Point and thus totally failing to create an energy economy conducive to a sustainable future. When it comes to climate diplomacy, the EU was vital in securing the global climate change agreement in Paris last December. The Scottish Government played an active role in pressing for an ambitious agreement through our international engagement with the EU institutions, member states and international influencing. By acting together as Europe we increase our impact on negotiations and take the collective decisions that a solution to climate change requires. When I led a minority Government in Scotland our Parliament passed the most ambitious climate change legislation in the world. However, it was on the European canvass that has allowed these hopes to come closer to fruition. The EU has guaranteed significant employment rights and social protections across the continent. Workers across the continent have the right to work for no more than 48 hours per week and rights around situations of redundancy, information and consultation. And, when it comes to social standards we have the EU to thank for preventing the UK government’s draconian Trade Union Bill further weakening trade union rights. I shudder to think how the present UK government would approach social rights if we were out of the EU. One look at the Health Secretary’s treatment of junior doctors in England is a stark example of the difficulties workers face at the discretion of a Tory government. In Scotland, under the SNP government, policy gravitates around creating equal opportunities so that no matter your background everyone can achieve their full potential. The Scottish Government first introduced a living wage across the public sector and now there are well over 400 organisations paying the living wage in Scotland and more than 80% of Scots receive £8.25 or higher. This is a flagship policy that we promote at home and abroad because being a member of the EU allows Member States to come together to learn best practice and share social policies. Indeed the newly elected SNP government has just been re­-elected on a pledge to provide a free baby box to new parents. This policy provides greater support to new families and helps tackle child poverty. The baby box is modelled on the ‘maternity package’ scheme in Finland which has run for more than 80 years. In Europe we have much to learn and share with each other through institutions here in Brussels and European forums to develop such social policies. The NHS is Europe’s largest employer and the EU is not only investing in its development, but also protects workers and those accessing healthcare. In October 2014, Scotland’s then Health Secretary, Alex Neil, became the first European Minister to sign the Glasgow Declaration. The Glasgow Declaration called for the creation of a European Dementia Strategy and national strategies in every country in Europe. It is therefore very fitting that today Scotland has the lead role in coordinating the next phase on EU collaboration on dementia. Fifteen organisations from 11 Member States are working together to improve dementia diagnosis, care and support. The absolute necessity of European membership in upholding our social rights rests in the very simple fact that today’s problems may be local but the solutions are global. The EU is not perfect. Indeed as Robert Schuman pointed out 66 years ago, Europe will not be made all at once, or in a single plan. The European movement and project is live and reacting to the day's challenges, economic circumstances and therefore does – from time to time ­ need reform. The problem with the Prime Minister’s reform was that from the outset it was symbolic rather than purposeful; aimed at stemming a severe Tory rebellion rather than driving forward reform. We wanted reform to regulations so that they are based on the principles of proportionality and subsidiarity. We wanted economic and social policies prioritised so that they reflect the concerns and aspirations of citizens across Europe. We wanted reform – not a referendum – because Scotland’s commitment to the EU is founded on our awareness of the practical benefits it brings. And there is so much more we can do to bring about a new Europe with a reinvigorated drive to boost economic activity and hope for millions in renewed solidarity. Next year referendum willing the UK is set to host the EU Council Presidency. There is no better opportunity to influence the political process in Europe and set an agenda to boost jobs. The priorities must be economic diversification, security and solidarity. This positive vision for the future of Europe is the campaign that the SNP will be running over the next six weeks – hope rather than fear. It is therefore worrying – that in the soulless campaign so far – we have listened to many conflate the world’s biggest humanitarian disaster of refugees fleeing violence and oppression with economic migration. This is not only scaremongering but unfettered malice on the part of those who wish to isolate the UK and ignore the cries of help from those fleeing evil. Shortly after this speech I will be returning to London where tonight the House of Commons will vote on the Immigration Bill. This bill has the potential to give unaccompanied young child refugees the right to come to the UK and live a normal life. SNP MPs have repeatedly called on the Prime Minister to give refuge to these young children and tonight it seems that the Government will finally confirm that it is bowing to the clear will of the majority of people across the country. However, when the Prime Minister of the United Kingdom describes refugees fleeing an evil and barbaric regime as a “ swarm” and “ bunch of migrants” he has not only brought disgrace on the office he holds but has failed in his duty to be a leader. Because as we lift ourselves out of troubled times, it is our moral responsibility as human beings to help others and not to pass by on the other side. What is each ringlet of your golden hair / when weighed against that poverty and fear / which Europe’s people bear and still must bear / from the first slave­ship to slavery entire? What binds Europe together ­ what gave the founding fathers such a powerful determination 66 years ago today ­ was that they never wanted the horrors of Dachau, Auschwitz, and the many other concentration camps across Europe to poison our world again. As a member of the UK’s Holocaust Memorial Commission, I know it is imperative that we never forget the horrors of the past in order that we never take peace for granted and ignore others cry for help. In Scotland, the threat of the UK voting to leave the EU and dragging Scotland out has never been more stark. 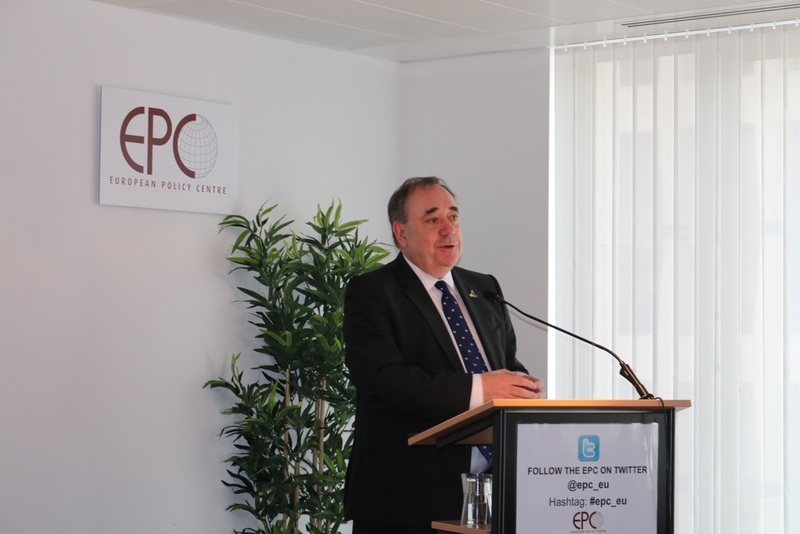 When I visited Brugge in April 2014 I predicted “the real risk to Scotland’s place in the EU is not the independence referendum in September. It’s the in­out referendum of 2017”. For the sake of modesty I accept I was wrong on the date, but two years later we find ourselves exactly in that position. For Scotland, the problem does not lie in Europe but Westminster. For too long we have been cut out of the decision­making process by a Westminster government pursuing sham negotiations on our behalf. I demand that a Scottish Minister should Chair the European Fisheries Council when the UK holds the EU presidency next year. But for now, we have our membership is being gambled by a Prime Minister still dancing to a UKIP jig and fighting for the narrow interest of his own party’s political survival. Let there be no mistaking that whatever the outcome, Scotland will have its voice heard. My hope and purpose over the coming six weeks is to campaign for a resounding vote for the UK to remain in the EU. However, as some polls suggest, should the result fall in favour of a vote to leave but Scotland had voted to remain then the democratic decision becomes a constitutional conundrum. That’s why Scotland’s First Minister, Nicola Sturgeon, has been clear in that such a material change would almost certainly bring about a groundswell of anger loud enough to trigger a second independence referendum. Politicians and parties which seek to deny that right would be swept away by the political winds that would then blow. So, we have 45 days to take this positive message to the voters; not be afraid of celebrating Europe’s achievements whilst pointing out where we need to work together better and setting the agenda for a new Europe with renewed solidarity and reinvigorated economic activity. We want a Europe which prioritises growth and recovery, a Europe which remunerated the concept of a social contract and a Europe which responds with solidarity and humanity when faced with a refugee crisis. Europe must lead – the way it lifted itself 66 years ago today and resolved to work together for the better of all – to build a universal right and hope for every European citizen so that we can live together in peace and harmony. It can do this but only with the united resolve of its 28 Member States and the UK must endeavour to turn the campaign for ‘remain’ away from fear mongering and into a force of hope and achievement. There was a call in times gone by for a "people's Europe". It was a hope, an aspiration perhaps even a cry from the heart for change. There is certainly much to be done to make that vision a reality. However this is not the time to give up on an ideal which has defined the politics of Europe for the last 70 years. Rather it is the moment to rededicate our efforts and to embrace a new direction. This is not the moment to bid farewell to some of the greatest achievements of our age. It is rather the moment to once again seize the opportunity of a collective future. We are twenty-eight nations, with the hopes, dreams and aspirations of our peoples at our heart - peoples made up of all nationalities and religions, creeds and colours - they represent the true wealth of this Continent. A individual country's sovereignty comes from influence, not force, from soft, not hard power, from enlightened self interest, not self-interest alone. Let these be the guiding principles that define how the UK votes on 23rd June. The people of Scotland are the true guardians of progress, and it is in them I trust, and it is with them in mind, that I will campaign with passion and conviction for our continued membership of Europe. Scotland's place in Europe will endure and our relationship will live on. Peter Grant MP, Lisa Cameron MP, Alex Salmond MP, Tasmina Ahmed-Sheikh MP, Patrick Grady MP, Stuart Donaldson MP.